Recurrent primary membranous nephropathy (MN) is known to occur in renal allografts in about 40% cases, leading to graft dysfunction. Recurrence is most common 2–3 years post–renal transplant but can occur as early as 1 week. Protocol biopsies can reveal the recurrence before proteinuria develops. In early cases, light microscopy (LM, including periodic acid–Schiff or silver stains) will not demonstrate diagnostic abnormalities; however, deposits can be detected by immunofluorescence (IF). Rodriguez EF et al. added Stage 0 in electron microscopic (EM) staging system, where deposits are seen only in IF. We report a case of recurrent MN 8 days posttransplant, with emphasis on the ancillary findings, which helped in arriving at a conclusive diagnosis. 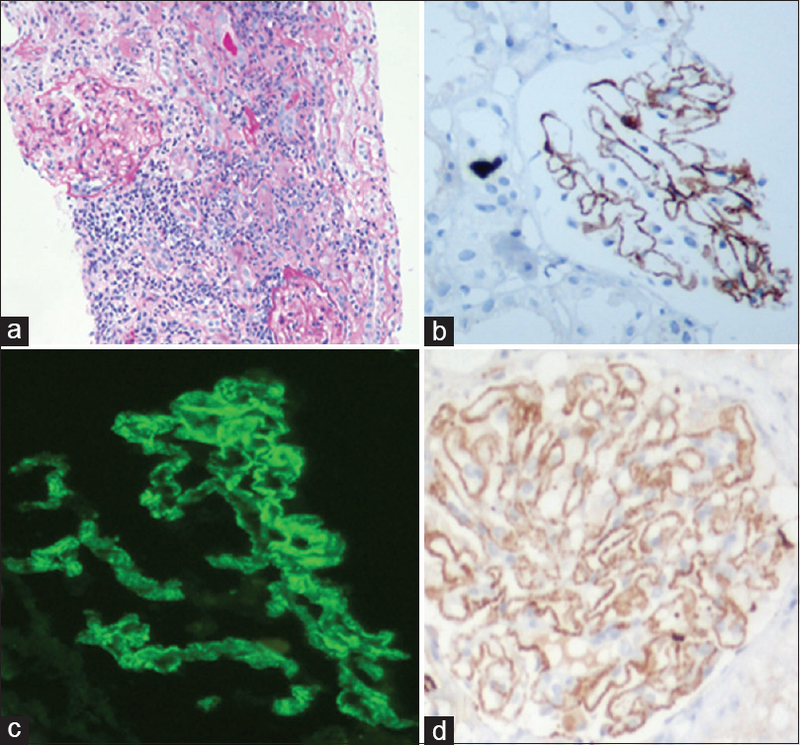 A 19-year-old male presented with nephrotic syndrome, with the three biopsies in 2010, 2013 and 2015, reported as MN, with progression to end-stage renal disease in June 2015. PLA2R antibody titers were >1500 RU/ml (6 months before RT). He underwent a live-related RT, with mother as donor, in January 2016. An unexplained rise in serum creatinine was seen on the 8th postoperative day, due to which a renal biopsy was done. Renal biopsy showed essentially unremarkable glomeruli with evidence of acute T-cell-mediated rejection (TCMR), Type 1A. IF study showed fine granular deposits of IgG along the glomerular basement membrane (GBM). C4d immune stain findings showed strong granular staining along the GBM, being negative in the peritubular capillaries. Immunohistochemistry for PLA2R was done which revealed a fine granular positivity along the GBM. In view of IF deposits and C4d and PLA2R positivity along the GBM, a concurrent recurrent MN is present [Figure 1]a, [Figure 1]b, [Figure 1]c, [Figure 1]d. On EM study, electron-dense deposits were not seen, suggesting it to be a Stage 0 MN. PLA2R antibody titer postbiopsy was 320 RU/ml (cutoff 20 RU/ml). On follow-up, progressive rise in proteinuria was seen, which reached a peak of 5400 mg/24 h in June 2016, after which rituximab was initiated. PLA2R levels were 760 RU/ml, before the initiation of rituximab. Thereafter, there was gradual fall in PLA2R titers, following which proteinuria also came down [Figure 2]. In this case, we describe the earliest features of recurrent membranous glomerulonephritis (MGN) in the allograft observed within the first 8 days, posttransplant period. MGN is characterized morphologically by subepithelial immune complex deposits, which in native kidneys are seen by IF and EM, and by LM in more advanced cases, with thickening of and “spikes” along the glomerular capillary wall. The MGN disease stages based on EM appearance consists of Stage I–IV. In this case, we observe IF evidence of immune complex deposition before these deposits are visualized by EM, and so, these cases represent “Stage 0” MGN or MGN by IF only. The same was demonstrated by Rodriguez et al. in their study on 21 cases of recurrent MGN posttransplant, with a mean biopsy period of 2.7 months posttransplant. Therefore, this case represents the earliest manifestation that one could find after transplant, in recurrent MGN. It was rising creatinine, due to ongoing TCMR which required urgent attention, due to which biopsy was performed. Furthermore, monitoring PLA2R serological levels is a useful methodology to monitor the recurrence and remission of MGN in such cases. Pattern of positivity in PLA2R stain, i.e., fine granular stain along the GBM, is also a useful clue to complement the diagnosis and confirm it as primary MGN. To conclude, MN can recur as early as 1 week posttransplant. Recognition of the fine granular staining pattern of C4d, the IF pattern, and the pattern of PLA2R stain positivity is important in arriving at a conclusive diagnosis, as the glomeruli can be normal on LM and significant proteinuria may be absent. The serum anti-PLA2R antibody titers are predictive of recurrence. Dabade TS, Grande JP, Norby SM, Fervenza FC, Cosio FG. Recurrent idiopathic membranous nephropathy after kidney transplantation: A surveillance biopsy study. Am J Transplant 2008;8:1318-22. Markowitz GS, D'Agati VD. Membranous glomerulonephritis. In: Jennette JC, Olson JL, Silva FG, D'Agati VD, editors. Heptinstall's Pathology of the Kidney. 7th ed. Philadelphia: Lippincott Williams & Wilkins; 2015. p. 255-91. Rodriguez EF, Cosio FG, Nasr SH, Sethi S, Fidler ME, Stegall MD, et al. The pathology and clinical features of early recurrent membranous glomerulonephritis. Am J Transplant 2012;12:1029-38.